Internet & Web Essentials: What You Need to Know. Ernest Ackermann and Karen Hartman ISBN 1-887902-40-6, 608 pages. 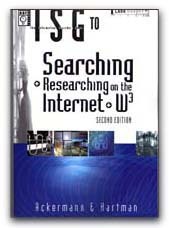 Searching & Researching on the Internet & the World Wide Web Second Edition. Ernest Ackermann and Karen Hartman ISBN 1-887902-56-2, Franklin, Beedle, & Associates.